We are SERVA! Watch a → Video to see where we are located and how we are serving scientists worldwide. SERVA Serving Scientists — 60 years of experience in the supply of quality reagents at SERVA provides expertise in manufacture, development and distribution of products worldwide. This know-how is the platform for outstanding customer service - all you need to succeed. Our mission is to bring innovative products to the life sciences market, meeting our customers needs. Technical competence and total quality management are the basis for continuous improvement. We pursue the highest standards in product quality, workplace safety and responsibility for the environment we live in. We dedicate our capacity and integrity to guarantee consistent product performance and continuity of supply. We are certified for ISO 9001:2015. SERVA was founded 1953 in Heidelberg a major center of the life sciences by the chemist Dr. Nikolaus Grubhofer. His idea was to supply fine biochemical reagents to research laboratories in academia and industry, to "serve science" (SERVA = lat. servare). 1961 the first catalog listed approx. 450 products. In the 1970's, SERVA was well known for its comprehensive program of Fine Biochemicals, supplying laboratories all over the world with top quality reagents. Evolving technologies for separation of biomolecules (bioseparation) initiated a new phase at SERVA: proprietary product development. A range of reagents for electrophoresis and chromatography was brought to the market during the 1970's and 1980's. Precast gels for Isoelectric Focusing, carrier ampholytes and other specialities are still produced in-house. In 1986, SERVA changed ownership to Boehringer Ingelheim Pharma Corporation, contributing to building a "bio-business". As a distribution partner for various key product lines from the USA, SERVA successfully met the instantaneous demand of the vast growing market of life science research. 1998 Boehringer Ingelheim Pharma finally decided to sell SERVA to the US-based Novex Corporation, a major supplier in electrophoresis. SERVA, now officially SERVA Electrophoresis GmbH, continued unaffected focusing on fine biochemicals, electrophoresis and life sciences. 1999 Novex Corp. was acquired by Invitrogen Corp., USA. 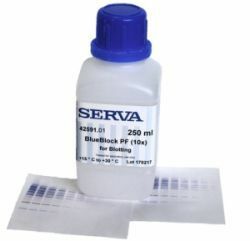 SERVA remained part of the Invitrogen group until 2002. After a management-buy-out in July 2002, SERVA Electrophoresis GmbH is now independent again, owned completely by German shareholders. The organisation continues, with headquarters in Heidelberg, supplying top quality products through its global distribution network. We build a bridge from the present to the future: Developing existing technology at SERVA further to become a leading player in the market of life sciences, specializing in certain areas. Our mission is to provide innovative products originating from our own know-how and through collaborations and strategic alliances. SERVA's commitment is to meet the changing needs of scientists while sustaining consistently high product quality and customer service. Future trends in the life sciences will be met pro-actively by innovative products from SERVA.